Give your readers the information they need to plan a trip. The widget is free to use, and very easy to set up. We even have a new WordPress plugin for those of you are using this platform for your travel blogs (more on that below). The widget will display the average travel costs for the selected country or city of your choice. Almost all countries and most major cities around the world are available for the display of the widget. Now, your visitors can get an idea of the typical travel prices so that they can plan their trips better. Here is what the widget will look like (for Paris). Do you have a WordPress travel blog? If you’re using WordPress, the travel cost widget is very easy to use. Simply install the plugin and then insert either a sidebar widget or one of the new “Gutenberg” blocks into the body of your post. 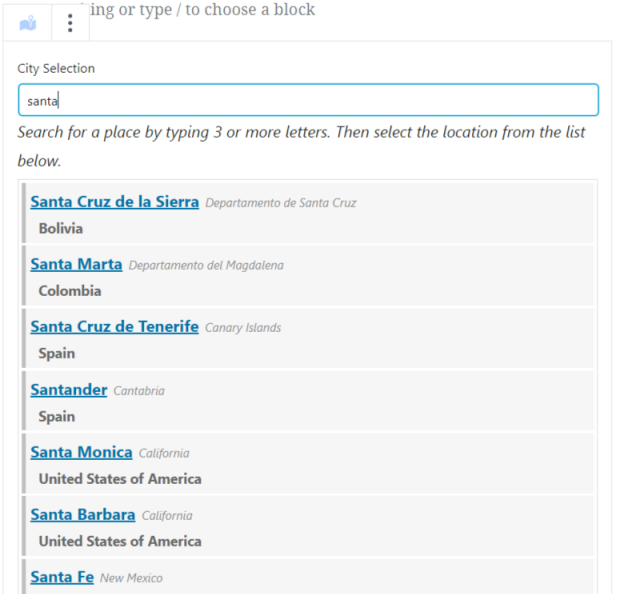 If you use the new block editor, you will easily be able to select your desired city or country and then insert the travel costs with a few quick clicks of the mouse. When using WordPress, inserting the widget is very easy. You can read more about the widget on our Travel Cost Widget page, or download the WordPress plugin from the official WordPress.org plugin page. We will be making future additions and enhancements to the widget in the future. We will also be making more widgets! So, if you have any ideas or requests, please contact us and let us know what you’d like to see. Thank you for this new feature. As full-time travellers, we disclose all our by-country travel costs as a way of showing the range of daily costs to explore a country. As a rule, when researching a country, we have always used BudgetYourTrip.com as our first port of call to determine our budget. In fact, in the past, we have always included a link to the relevant country page on our finance blog posts. With this new functionality, I now plan to go back and update those posts with your suggested code. Check out https://minimalistjourneys.com/travel-costs-cuba/ to see what we are doing. Thanks for the feedback, and thanks for using it. I love all of your info on Cuba, too!